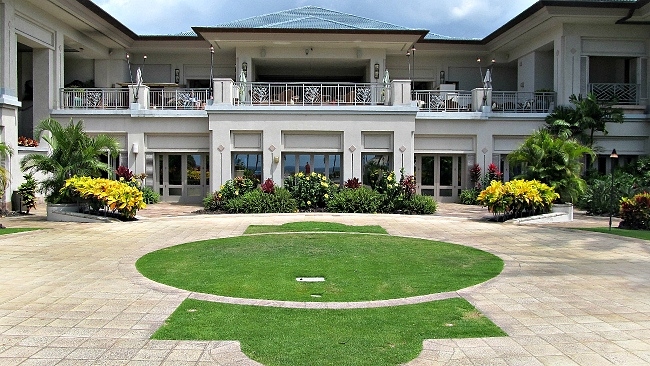 Fairmont Orchid Hawaii is consistently rated as one of the top hotels in Hawaii. Originally opening as a Ritz Carlton in 1990, the Fairmont does a fine job of pampering their guests. This gorgeous Kohala Coast resort hotel boasts five exceptional restaurants and is adjacent to the award-winning Francis H. I’i Brown Golf Course, with 36 holes of continuous play. 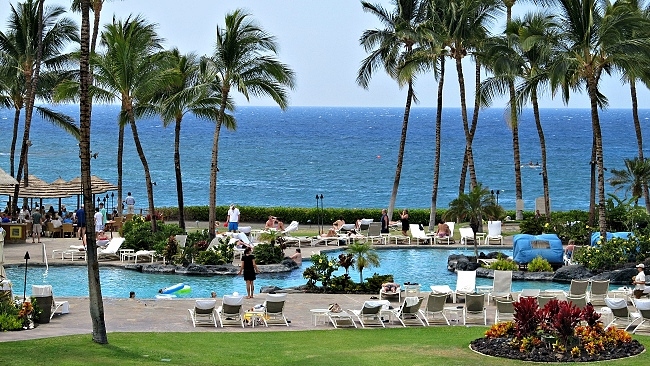 There is a very soothing and peaceful nature to the Fairmont Orchid Hawaii. Lather yourself in luxury as you enjoy sweet fragrances and brilliant colors of tropical flowers that permeate the resort, including an impressive display of orchids (naturally!). Lush gardens are well manicured and precise. Thick lawns are neatly groomed. Palm trees quietly stand watch over the grounds. The meticulously sculpted grounds complement the luxuriously appointed interior of the hotel. Tastefully decorated in a Hawaiian theme, guestrooms are a bit on the small side but are rich in their décor. All guestrooms received extensive refurbishing by the end of 2006. Bathrooms are large with separate shower/tub/dressing areas. There is a 42” flat-screen LCD television in all rooms. The lovely resort pool is adjacent to the bay, which has a small man-made beach that is calm and well protected. The snorkeling can be fun in the generally quiet bay, and it’s a great beach for kids. Hawaiian Green Sea Turtles are frequent visitors to the shoreline. Lots of complimentary activities are offered including outrigger canoe rides, hiking and exploring nearby petroglyph fields, introduction to surfing, and Hawaiian arts and crafts. Snorkel equipment, boogie boards, stand up paddle boards and kayaks can be rented for the duration of your stay. A daily children's program is available for $85/day. The tennis facility (10 courts) is the best on the Big Island and consistently recognized as one of the best tennis resorts in the country. There is also a 24-hour fitness center. For your dining pleasure, try the award-winning cuisine at Brown's Beach House, Fairmont's AAA 4-Diamond restaurant. Or if you really want to pamper yourself, relax and luxuriate in the resort's Spa Without Walls, featuring outdoor waterfall spa treatments and oceanfront massage. For your Saturday night entertainment, sign up for the colorful Gathering of the Kings Luau. 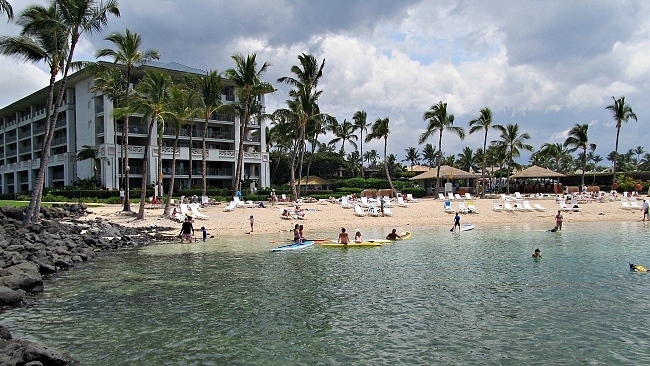 The Fairmont Orchid is located near the north end of the 3200 acre Mauna Lani Resort at Kalahuipua'a, 23 miles from Kona International Airport (KOA) and 29 miles north of Kailua-Kona. As part of an ancient Hawaiian fishing village, royal fishponds and petroglyphs are prominent here, with part of the historic Ala Kahakai Trail crossing through the resort along the coast.